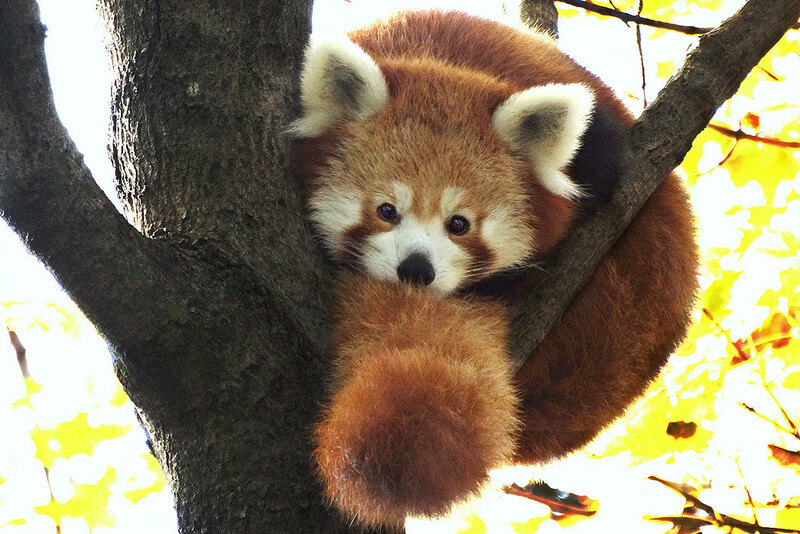 Three red pandas live in the Holtzman Wildlife Foundation Red Panda Forest: male Ravi, born in 2016; female Ash, born in 2015; and female Ta-Shi, born in 2005. The habitat features more than 14,000 square feet of naturalistic space with a flowing stream and waterfall, an arboreal pathway through the habitat, misting areas to cool the red pandas in the summer, land for exploration and a variety of nesting places. A canopy walkway extends 80 feet through the trees in the red pandas’ habitat and provides unparalleled views of these arboreal animals for adventurous guests. As their name suggests, red pandas’ fur is mostly rusty-red color. They have white markings on their ears, cheeks, muzzles and above their eyes. Their bushy tails are ringed with light and dark variations of the rusty-red color. Their fur also covers the soles of their feet to help give them traction and prevent them from falling off slippery, wet branches. The red panda, like the giant panda, has an extended wrist bone that acts like a thumb and allows it to easily hold onto bamboo. In the past, the red panda has been classified as a relative to the raccoon and the giant panda. Now, it is listed as its own scientific family – the Ailuridae. Red pandas are omnivores and eat bamboo, roots, acorns, fruit, eggs, mice and birds.